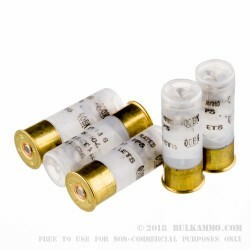 A high quality 00 Buck load that uses some small benefits to place this round on the radar of discerning shotgunners everywhere. The relatively standard 9 pellet load benefits from the nickel plated lead that holds shape well and offers superior penetration compared to most mediums. The 1325 velocity is fast, but still keeps recoil somewhat muted compared to many 00Buckshot loads, and the high quality builds in the Exacta line means that it will function in most shotguns that are chambered for 2 ¾” shells. The price is competitive and lower than most premium brands while still delivering the same or similar performance. 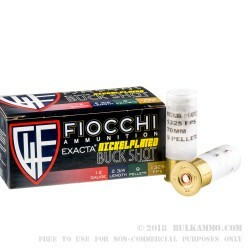 Fiocchi makes very high quality shotgun ammo, and this Exacta line is no exception. The attention to detail and the reliability of Fiocchi ammunition is daily helping the reputation of the brand as one of the premium import choices. 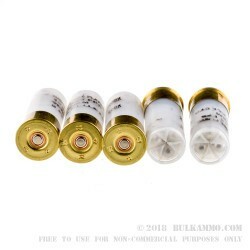 The 00 Buckshot load is suitable for target practice; patterning ahead of a hunt; hunting big game or predatory animals at ranges exceeding 50 yards and for personal defense/home protection uses. There is a genuine risk in super close quarters, of overpenetration so plan accordingly if you choose to use in an urban home environment, but otherwise this is a stellar round. This is what 00 buck should be! Q: Are these "High Velocity" shells the same as "Magnum"? I have a Remington 1100 12 gauge that takes 3 inch magnum shells, will these work? A: Yes, these shells will work in your shotgun - but no, they are not magnum (3") shells. They are 2 3/4" shells loaded to high velocity. While they are less powerful than the 3" shells, they will also have significantly less recoil.